Prototype: 4 different Belgian State Railways SNCB/NMBS M2 series commuter cars, leased to the Dutch State Railways NS. 2 type M2 B11 commuter cars, 2nd class. 1 type M2 B8D commuter car with a baggage area, 2nd class. 1 type M2 A5B5 commuter car, 1st/2nd class. Crimson basic paint scheme. The cars look as they did at the start of the Nineties. Model: The cars have separately inset, graduated window frames. The 7319 current-conducting couplings or the 72020/72021 current-conducting close couplers can be installed on all of these cars. The cars have different car numbers. All of the cars come individually packaged and marked, with a master carton. Total length over the buffers 110.6 cm / 43-1/2". DC wheel set per car 4 x 700580. 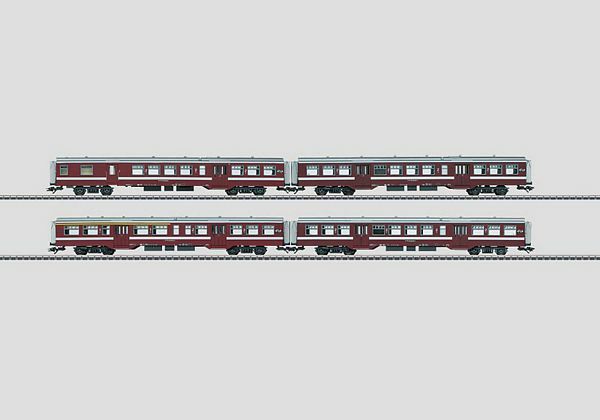 The electric locomotive to go with this car set can be found under item number 37126 in the Märklin H0 assortment.